YOU love my lessons. So will THEY. If you would like to send some of our tutorials as a gift, there are several options to choose from. You can send one of my FREE Gift CDs, one of my 99-Cent Tutorials, a Gift Certificate, or even choose from my entire library of courses. Choose the gift that's right for you. Watch the video to the right, and scroll down for all of the options. This gift CD includes a total of twenty (20) hours of tutorials in Windows, Word, Excel, and the Internet. Your gift receipient also receives a coupon to choose one additional course from our entire library of beginner lessons for free. The CD is free, you just pay for shipping & handling. This CD makes a great gift for the holidays, and there are several different "gift wrap" styles available. You can send any of our beginner tutorials to your friends and family for just 99 Cents. You can choose as many different tutorials as you'd like, and your gift receipient can either watch the lessons online, download them, or we can ship them on CD (you just pay shipping). Click here to send a 99 Cent Gift Tutorial. Not sure what they want to learn? That's fine. You can send them a Gift Certificate in any dollar amount over $10. We'll mail them a nice certificate in the mail, and you can customize the note. 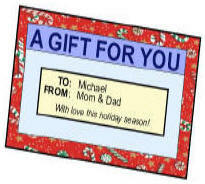 Plus, for every gift certificate you send, we'll give YOU a $5 coupon off your next order of $10 or more. Click here to send a Gift Certificate. You can purchase ANY of our normal 599CD tutorials and handbooks and have them sent to a gift receipient. Simply place your order as normal. After selecting "ship me a CD" as your delivery method, you will be asked if you want to order the lessons as a gift. Say yes, and you'll be prompted for the recipient's address, gift wrap options, and more. Click here to send ANY courses as a gift.